HomeOur BlogBangkok / What’s a Wat? Bangkok / What’s a Wat? 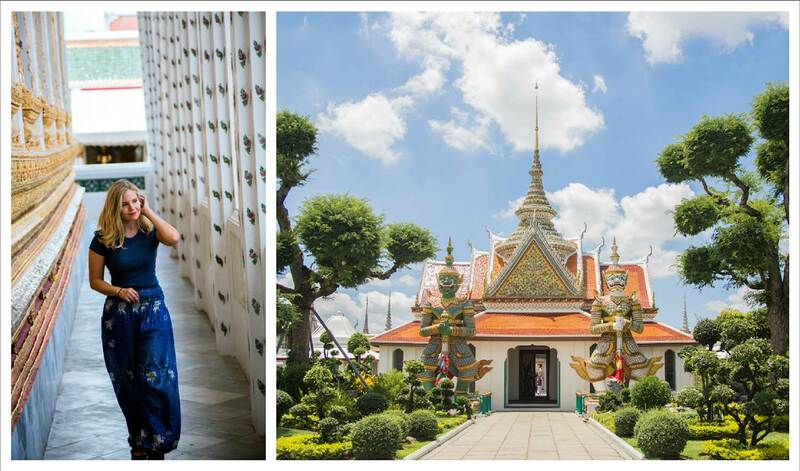 Dotting the city of Bangkok, are hundreds of Buddhist Temples, otherwise known as Wats. There seem to be Wats on every street, around every corner. They are as frequent as Starbucks, but serving up Nirvana. Seriously though, we wanted to get a better understanding of the Thai’s religion and culture, and in order to get a closer look, we decided to take a morning stroll around Bangkok. If you are brave enough to walk the streets of Bangkok, there’s a lot to take in. Every storefront seems to be straight out of an apocalyptic movie where zombies have taken over and people live in hiding. Stains run down the walls as if the buildings themselves are sweating in Bangkok’s sweltering heat. Low hanging, tangled messes of electric lines run the streets everywhere you look. The back alleys are narrow, dark, dirty and cluttered with junk that you at home might throw out without hesitation. In a normal city you might think twice before venturing down these dark avenues. But in Bangkok, the alleyways are alive with food carts, hidden restaurants, and vendors selling every trinket you can imagine. The maze of city streets seem to have no laws governing. Cars, mopeds, tuk-tuks and taxis weave in and out, nearly slamming into each other at every turn making the simple act of crossing a street near impossible. 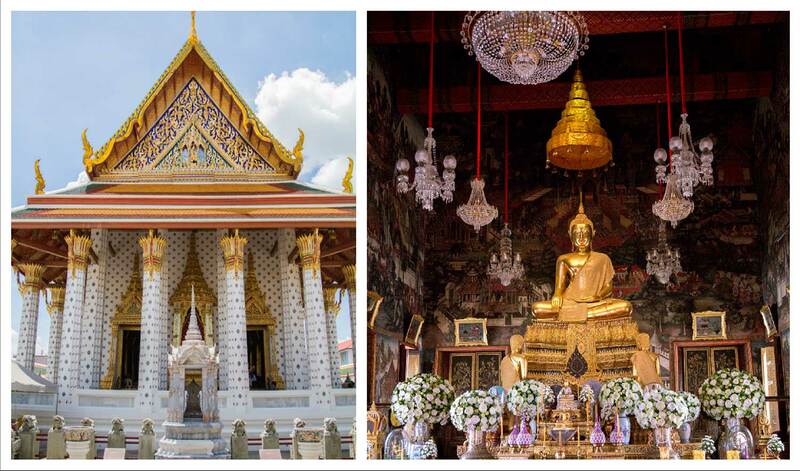 Sunglasses required for visiting these glistening Temples. But all this chaos outside, is completely juxtaposed to the peaceful, ornate, and lavish interiors of Bangkok’s many Wats. We visited 2 of the more popular Wats; Wat Pho and Wat Arun. 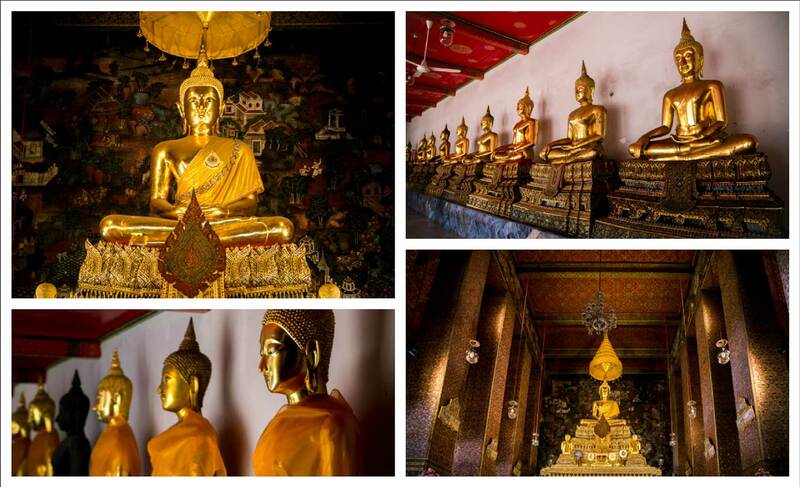 Wat Pho’s Massive complex housed temples trimmed with gold, walls covered in antique murals, and intricately carved statues and Golden-clad Buddahs around every corner. The main temple houses (but just barely) the famous reclining Buddha. The reclining Buddah symbolizes Buddahs last day, on his way to Nirvana. 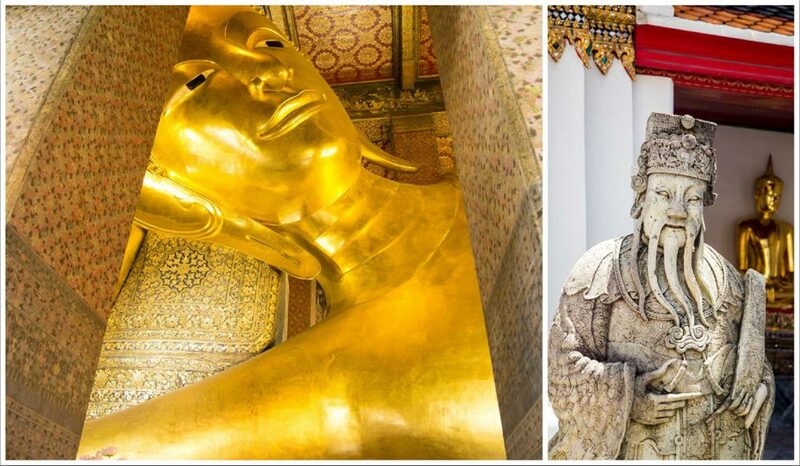 Wat Pho’s reclining Buddah statue barely fits. 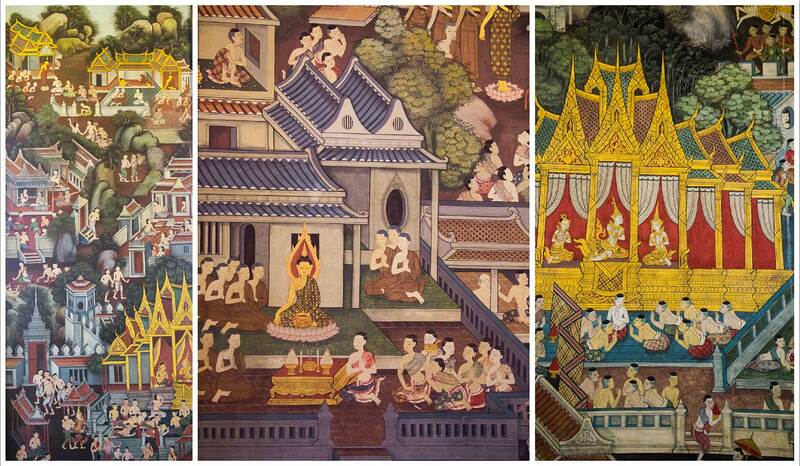 Wat Pho’s murals decorate the entire interior. Our sweaty mugs at Wat Pho. 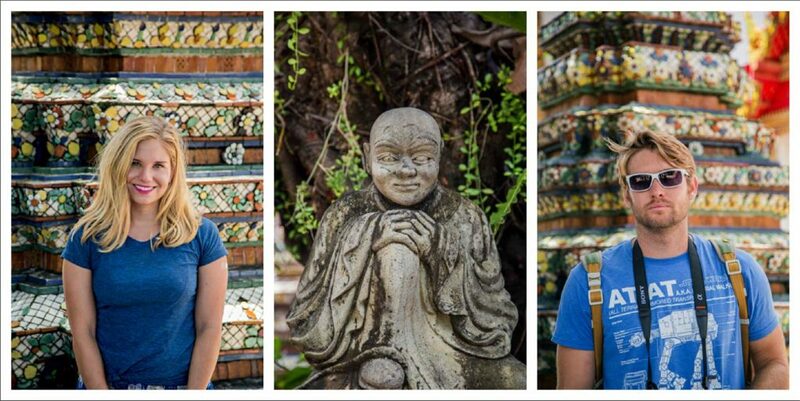 Wat Arun was my favorite. Painted porcelain roses dotting its exterior stood out to me as unique. My jaw drops at the rich color and elaborate textures that each Wat unfolds before me. Next door Wat Arun’s famous “Prang” handsomely juts up into the sky, and is easily visible from the Chao Phraya River that cuts through Bangkok. Its all in the details. 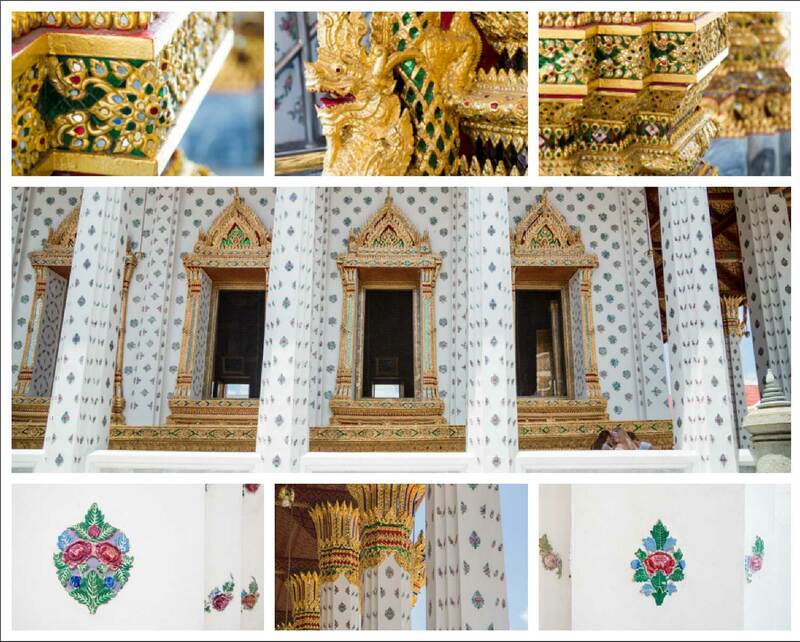 Wat Arun is an absolute feast for the eyes with its unending details. 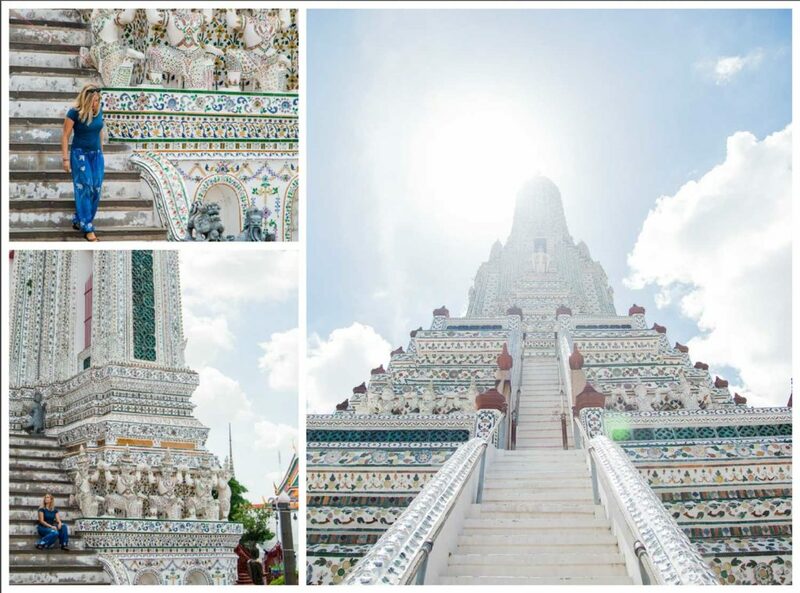 Wat Arun’s Prang juts high into Bangkok’s cityscape. 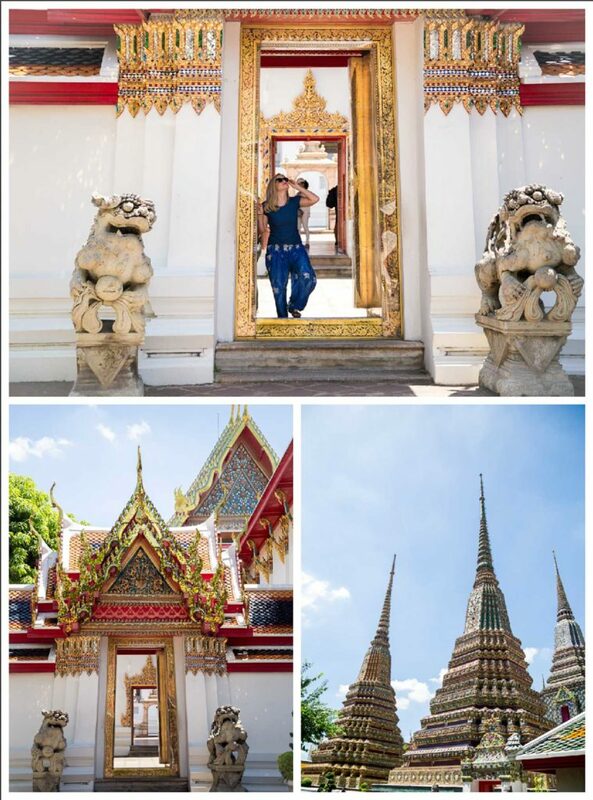 Despite being caked in never-ending layers of sweat, we enjoyed a day of Wat hopping and exploring a bit of Bangkok. 2 Comments on "Bangkok / What’s a Wat?" Very nice photographs surrounded by exquisite text. Keep it up! I assumed I was going to be sick.